My Wandering Life: Best. Gift. Ever. After a couple of days of letting the boys think the computer on the new desk in the corner was for Daddy, we revealed tonight that it was actually for them! They were so stunned that a rare silence fell over the Chase household for a few moments while it sunk in. And then the joyful shouting began! A company up north had just replaced all their computers and then went under. They were selling everything off for pennies on the dollar, still under warranty. We got one before they were gone, and preloaded it with the websites we allow them to go to along with their favorite programs. It occupies the corner opposite my desk, so there will be plenty of supervision at all times. 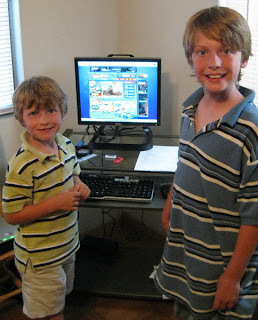 Right now they earn time on the computer by doing things around the house and getting a good report from their teachers, and that won't change now that I don't have to share my computer with them! And just to update you, my brilliant husband fixed the email problem, happiness is restored! Although my email address book has apparently not been recovered, so if you are someone who emails me (or someone I email), please shoot me a quick email so I can start building that back up again. Bummer.